Set in a quiet residential area, this villa to rent in Sueno Azul, Tenerife has its own private pool set in beautiful established gardens with leafy palms and flowering shrubs. This lovely Tenerife villa is in the prestigious area of Sueno Azul, Callao Salvaje - a small, yet popular resort on the west coast of the island, a ten minute drive from lively Playa de las Americas. The villa also benefits from wifi. A unique Tenerife villa to rent, it is a private villa and benefits from a rectangularly shaped pool area. 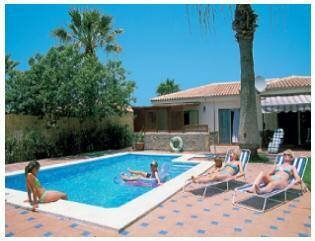 The pool is electrically heated from 1st November until 30th April. Patio table and chairs, sunbeds, portable BBQ. Electrically heated pool.